(TORONTO, ON) – A recent BMO study showed that Canadian parents are expecting to pay close to half (42 per cent) of their children’s post-secondary expenses, including tuition, books, and living expenses. But parents may be biting off more than they can chew. The projected costs for a child born in 2014 are expected to top $140,000 for a four-year degree. In 1992, the average tuition for a year undergraduate study cost $1,772. By 2006, the price increased to $4,870. 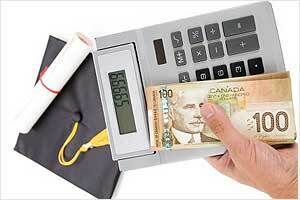 In 2014, Canadian students paid an average of $5,772. So how are parents dealing with sky-rocketing tuition? BMO found that two-thirds (66 per cent) of parents have started a Registered Education Savings Plan (RESP) – a significant increase from 2012, when only 52 per cent of parents had set up a RESP. Start early – In order to enjoy the long-term benefits of an RESP, parents should start it up as soon as they can. Compounding returns will reward parents who are in it for the long-haul; parents who start late may not see as much growth. Start small – You don’t need to break the bank each month when paying into an RESP, particularly in the early days. Young parents should add what they can afford and they can always increase payments when they become more financially secure. Don’t forget about today – Many Canadian parents hope to support their child’s education, but that doesn’t mean they can actually afford to. Get your financial house in order first and pay down your debts. A robust RESP is an ideal scenario, but don’t ignore your day-to-day expenses. Redirect gift money – Grandparents might be inclined to give cash to a child as a birthday gift, but it’ll likely be squandered at the ice cream store. Parents could encourage family members to make their gifts truly count by contributing to the child’s education. Get the government to pitch in – Some parents are not aware that the government will add to your RESP through the Canada Education Savings Grant. The grant will match 20 per cent of the first $2,500 contributed annually to a maximum of $500 a year.